Imposter Scams Here’s how they work: You get a call or an email. It might say you’ve won a prize. It might seem to come from a government official. 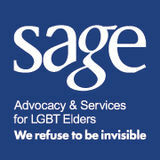 Maybe it seems to be from someone you know – your grandchild, a relative or a friend. Or maybe it’s from someone you feel like you know, but you haven’t met in person – say, a person you met online who you’ve been writing to. Whatever the story, the request is the same: wire money to pay taxes or fees, or to help someone you care about. But is the person who you think it is? Is there an emergency or a prize? Judging by the complaints to the Federal Trade Commission (FTC), the answer is no. The person calling you is pretending to be someone else. Here’s what you can do: 1. Stop. Check it out – before you wire money to anyone. Call the person, the government agency, or someone else you trust. Get the real story. Then decide what to do. No government agency will ever ask you to wire money. 2. Pass this information on to a friend. You may not have gotten one of these calls or emails, but the chances are you know someone who has. Please Report Scams If you spot a scam, please report it to the Federal Trade Commission. 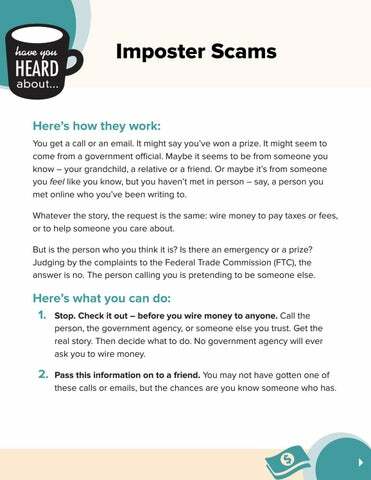 Information from the Federal Trade Commission to help recognize and report Imposter Scams.